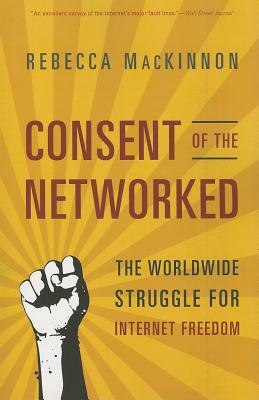 The Internet was going to liberate us, but in truth it has not. For every story about the web's empowering role in events such as the Arab Spring, there are many more about the quiet corrosion of civil liberties by companies and governments using the same digital technologies we have come to depend upon. In Consent of the Networked, journalist and Internet policy specialist Rebecca MacKinnon argues that it is time to fight for our rights before they are sold, legislated, programmed, and engineered away. Every day, the corporate sovereigns of cyberspace (Google and Facebook, among others) make decisions that affect our physical freedombut without our consent. Yet the traditional solution to unaccountable corporate behaviorgovernment regulationcannot stop the abuse of digital power on its own, and sometimes even contributes to it. Rebecca MacKinnon works on global internet policy as a Schwartz Senior Fellow at the New America Foundation. She is co-founder of Global Voices Online, a global citizen media network that amplifies online citizen voices from around the world. She is also on the board of the Committee to Protect Journalists and worked for CNN in Beijing for nine years. Recently, she was a Visiting Fellow at Princeton University's Center for Information Technology Policy. MacKinnon is frequently interviewed by major media, including the New York Times, Wall Street Journal, Washington Post, The Financial Times, National Public Radio, BBC, and other news outlets. She lives in Washington, DC.